Muni lines N and T, as well as a few blocks away from Caltrains and the Embarcadero Bart Station. 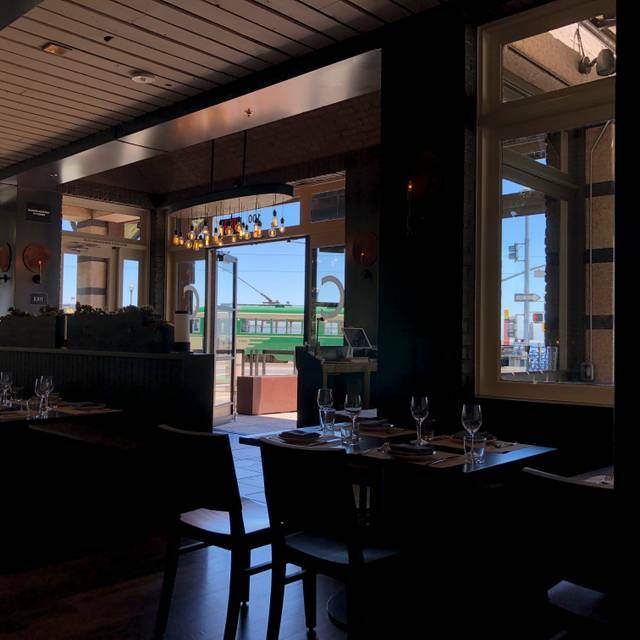 Ideally located on the Embarcadero, and with sweeping views of San Francisco’s renowned waterfront, CENTO Osteria invites guests to experience seasonal Italian fare in the style of a classic osteria. Chefs Donato Scotti and Gianluca Guglielmi have created a menu of simply prepared, crave-worthy food enjoyed in regions across Italy, which pairs perfectly with a carefully curated selection of wine, cocktails and beer. CENTO’s warm, open and inviting space, including a spacious outdoor patio, sets the stage for remarkable wood-fired Italian specialties crafted from housemade ingredients that are prepared with a native Italian’s touch. Patio seating is on a first come, first serve basis. 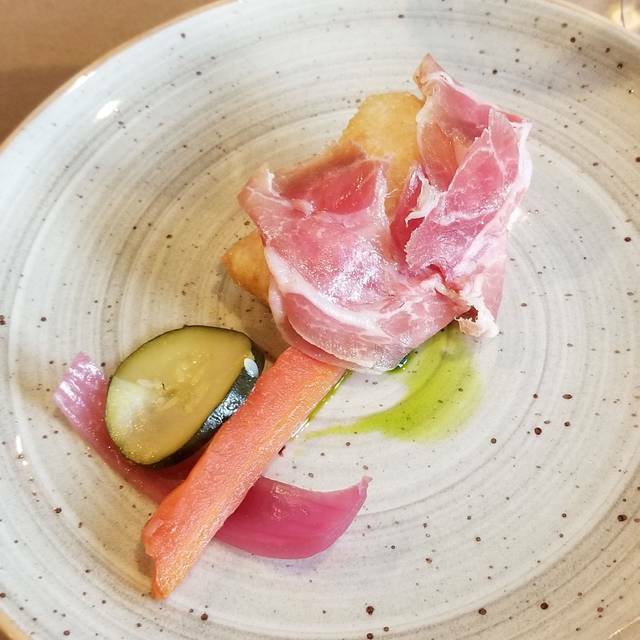 Please join us for our Apericena which is an Italian style happy hour, Monday through Friday from 3:30 - 7pm with dinner seven nights a week starting at 5pm. And now open for lunch and brunch! Smoked salmon mousse, grilled polenta, pickled green tomato, and parsley oil. House-cured beef, radishes, and parmigiano. Meat ravioli, brown butter, sage, pork guanciale, grana padano. Whole grain pasta, wild boar, sangiovese, and frying peppers. Add Ons: Egg $2, Arugula $2, Bufala $4, Proscuitto $4. Tomato, fresh mozzarella, and basil. Spicy salami, tomato, pickled peppers and onions, and mozzarella. Wood oven house-cultured buttermilk pancake, strawberries, and pickled roses. Cast iron crispy risotto, "cotto" ham, and over easy egg. Grilled eggplant, caciocavallo, and sunflower seed tahini. Romano and blue lake beans, and grana. Initially service was great. When it came time to pay the check we literally had to wait 15 minutes to get another waitress to help. Our waiter Daniel did not to come back to our table as he was busy serving a table of 8 who needed several bottles of wine opened and serves. 15 minutes for that? Hmmm. Food is great. We initially had a group of 10 but due to a long day 6 people cancelled on us. The restaurant appeared a bit upset by this but the restaurant was largely empty and we were the last table they serviced before closing the restaurant. So although I feel bad for over booking our needs it does not appear to have had any major impact on the restaurant. We did apologize a number of times. Thank you, Danny for making it a wonderful birthday dinner for my friend! We had a delightful time. The pizza by your recommendation was so delicious - I’m going to bring other friends over! And the gnocchi melted in my mouth. My friend loved her raviolis and the desserts topped off a fab night into a very memorable one! I’m so glad to have discovered this restaurant and will see you soon! We came for a post wedding celebration. Not a formal planned thing, a spur of the moment (for weddings) event, CENTO was beyond wonderful! Their accommodation of us and terrific service alone was terrific. But add to that fabulous food and interesting wines are worthy of many repeat everyday celebratory visits. Branzino is a must. Whatever ravoli they offer, order it. Pizza. Wood fired. What else do you need? Fantastic artichoke appetizer. Hope you get there before they are out of season. Our server was professional, but rather unfriendly, and did not seem terribly invested in our experience. 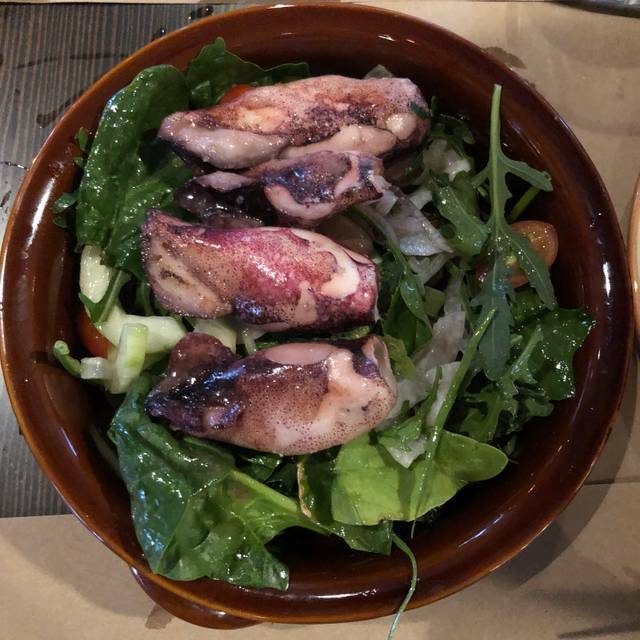 The radicchio-bean salad wasn’t worth ordering—the beans completely overwhelmed the flavors and textures of everything else. The pizza dough was wonderful, but the flavors were unbalanced—anchovy/caper/olives were overly salty without anything to offset them. The ambience is a little too bright, turn down the overhead lights a bit please. The pizza had great flavors and crust, but came out a bit cold, but will certainly try it again. Salad was great and the homemade raviolis outstanding! The salad was mixed greens out of the box with some dry chicken. There are so many good restaurants in this area so Cento Osteria was a big disappointment. 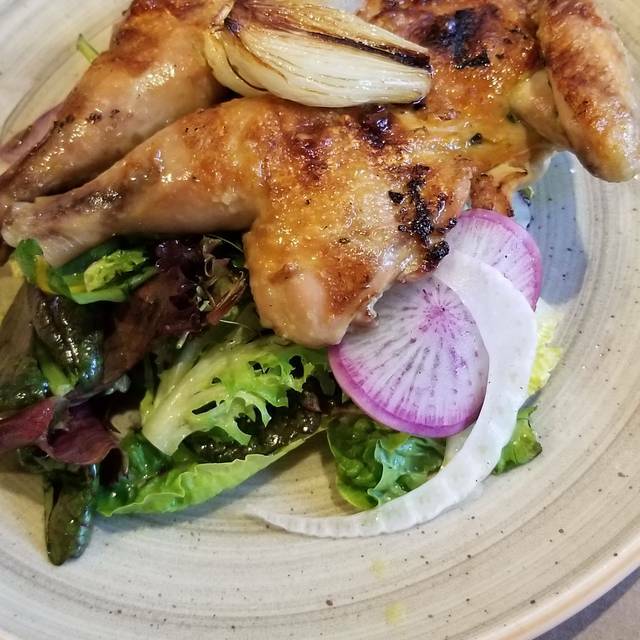 I visited Cento Osteria with a friend from out of town for lunch. 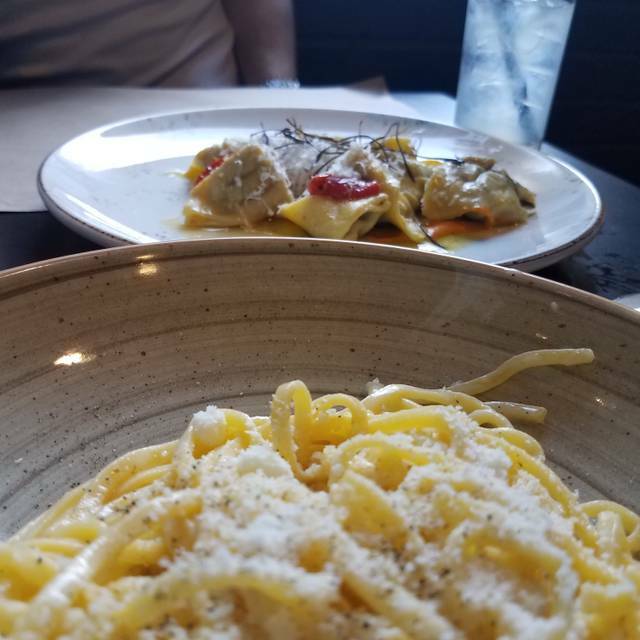 She ordered the squid-ink pasta, me the cacio e pepe. Hers turned out alright, the calamari was cooked well but the pasta was a bit bland. My cacio e pepe was instead some decent pasta swimming in what I can only guess was pasta water instead of the creamy peppery cheesy coating that it should be. I think they took the easy way out instead of properly tossing it together and it shows as all the ingredients tasted like they were of high quality but the preparation left it a mess. Service was above decent but nothing exceptional. I'd still recommend Cento for their pizzas, but their pastas leave much to be desired. Everything we six ordered was delicious. The staff was very welcoming and fun. We will return! Absolutely love this place. Such a wonderful addition to the neighborhood. Everything is delicious. Beautiful space with open kitchen and a wonderful ambience. Some lovely views of the water, and just a good vibe. Ask for Antonio he’s an excellent server. The food at brunch and dinner have been outstanding. Fresh ingredients, some creative combinations and a menu with good variety. Don’t miss this place, we have it on repeat! Enjoyed everything we ordered ... service was attending and good. For sure will come back again and recommend it. PIZZA WAS GOOD. ALL THE SIDE DISHES WERE UNDER COOKED, HARD AS ROCK, AND NOT VERY GOOD. The pizza was burned. The salad and tuna sandwich were good. The waiter although charming was no where to be seen when needed. My office teammates and I have walked by this place a hundred times, but it was always fairly empty, so we never considered going. When it showed up on OpenTable as having an opening for a group of us, we decided to be the Guinea pigs of the office, since no one else where I work had been either. When we walked in, we were surprised to see such a charming place... not to mention, the sign outside showed off a great happy hour. The menu selection was solid, too. I think we may have put this place on our go-to list... however, the service was really terrible. Restaurant managers, if you're reading this, PLEASE let your staff write their orders down. Memorizing (or at least trying to) does not impress your diners, especially not when order by order, our server kept getting it wrong. 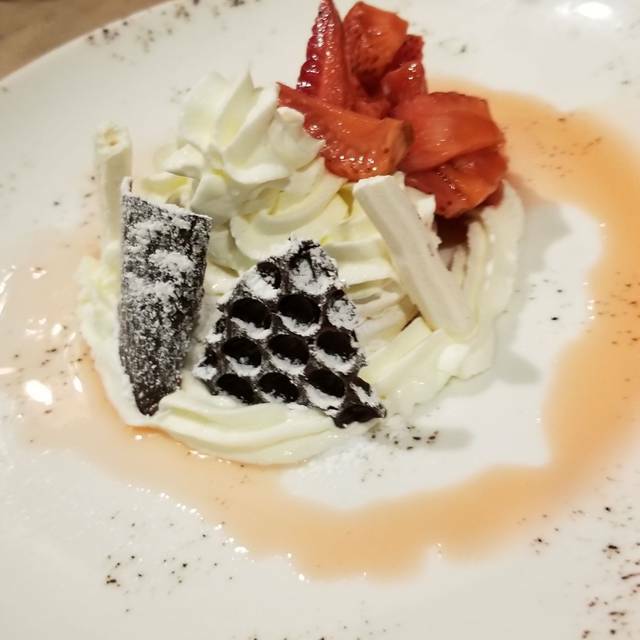 In the end, the food was good, and the manager tried to make it up to us by offering free dessert... but the waiting for the wrong order... and then waiting again for something near-to what we ordered just wasn't worth it. We had pizza few weeks ago and tonight again. The dough is one of the best I had so far, light and crisp, not too chewy. Pear with cheese and margherita were very good; funghi, pancetta and ricotta could have been better if mushrooms and pancetta were more roasted, in my opinion. For dessert we had millefoglie with passion fruit cream, I loved it, the puff pastry was crisp and not too sweet. This is a favorite spot in our neighborhood, and we frequent it for dinner and happy hour. It was our first time for Sunday brunch, and it did not disappoint! The menu was varied, egg dishes or pasta, pizza, salads and starters. The service was first rate, ask for Antonio. The food was delicious and beautifully presented. The space is warm and inviting, with an open kitchen. We will be back for brunch soon. Thank you Cento! Worst experience ever. Valentine’s day nightmare!!!!! The food was tasty, but the main dish seemed borderline undercooked when it arrived and the service incredibly slow. Possibly the slowest I have ever experienced anywhere. Staff were friendly enough, but there was some problem in the kitchen and everything just took forever. It wasn't even that packed, but there also didn't seem to be enough staff on hand. We weren't in a big rush, so I guess it was fine and I am willing to put it down to an off night. loved the ambience! would be nice to have more vegetarian options. Great neighborhood restaurant. Always great food and wonderful service. 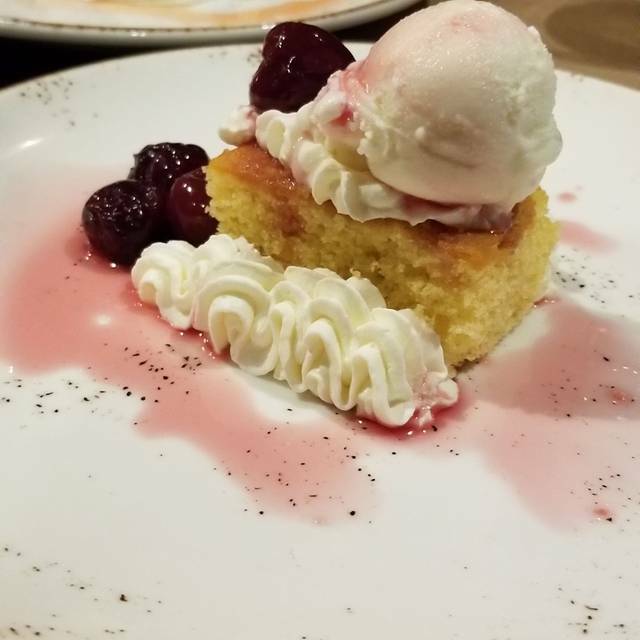 Cento Osteria is a lovely, warm, neighborhood restaurant. The food is lacking though - and sometimes I question how fresh the ingredients are. I once wanted to order their swordfish, which I'd had before, and they prepare it very nicely. It was a Sunday, and I asked if the swordfish was fresh from that day. I was told is was from Thursday - so I didn't order it. Maybe I'm fussier than most, but I didn't want 4 day old fish in a restaurant. I had the pizza the other evening, and the crust was soft and doughy. My husband is very happy with the pasta dish he orders. We go there for convenience and a lovely room - not for the food. Great food, good wines, friendly staff! Love this restaurant. Have been here frequently for “happy hour”, birthdays, lunch get togethers and dinner. Food wonderful. Menu filled with variety and something for everyone. Wine list superb. Attentive staff. Overall a terrific dining experience! Donato’s newer restaurant is an absolute delight. We are big fans of his establishment in Redwood City and now very excited about Cento. He certainly delivers with the freshness and authentic yet innovative dishes. The salumi pizza was yummm n spicy! Branzino was fresh n tender and a light preparation with artichokes. And the buckwheat pasta (at least an inch wide) with kale omg was unbelievable. Can’t wait to go back for more. Had the fix price menu during SF restaurant week and pizza. 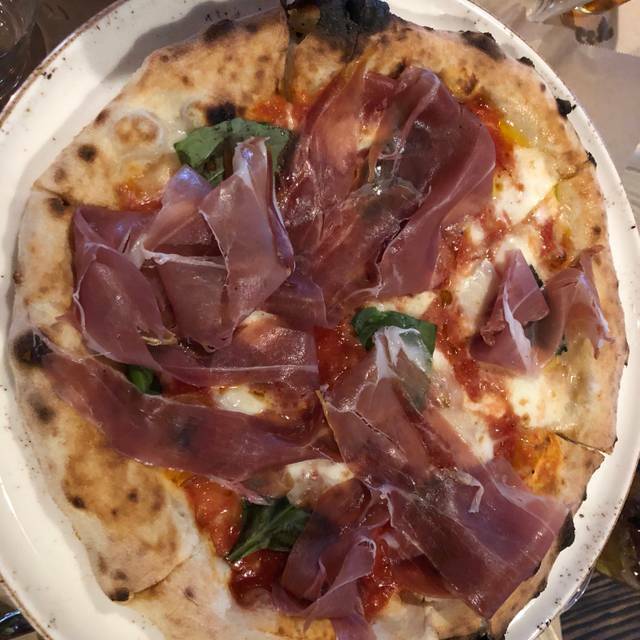 The pizzas were the best I had so far in California (both margherita and pear/cheese) and the rest of the food was tasty, well done and good value for the money. Service a little bit slow, even if the restaurant was not full. Overall a great experience, though. This is a great neighborhood restaurant. The food is always good and the staff is always friendly. I recommend it highly. We live in the neighborhood and tried it for the first time. Glad that we did. All fresh, organic, bread is amazing, I would recommend anything and everything on the menu! Salads are great, the presentation they give with food is epic! My sausage and shrimp rigatoni dish for $19 was missing the sausage that it advertised. When is asked the manager where the sausage is in my dish, she told me ‘it has sausage paste.’ SAUSAGE PASTE? What is that? There was absolutely no sausage in this dish. 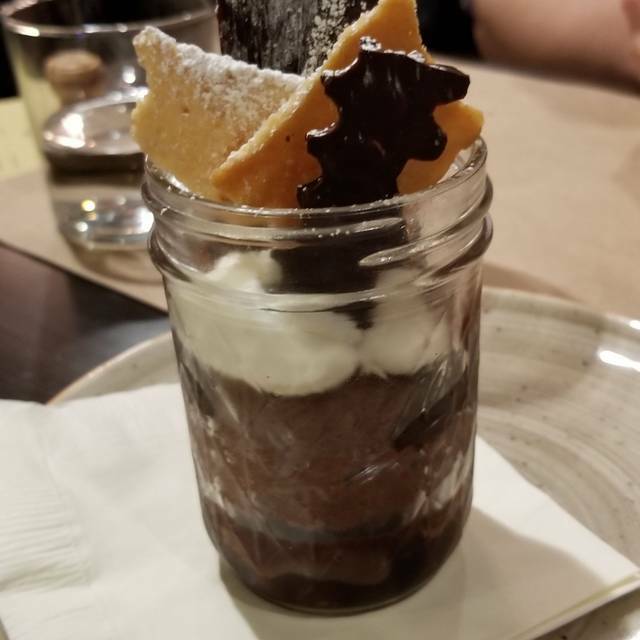 Also, it was birthday and they did comp a dessert so that kind of made up for the missing sausage. Great service though. Went for lunch and then came back for dinner shortly after. Service is very friendly, ambiance very comfortable, and the food was delicious on both occasions. $5 for a small Diet Coke and was not told there are no free refills. $10 for a can of Diet Coke. Sorry, we will never be back. Food was good though. Bummer! Wonderful flavors. Everything good. Going back again. Portion is crazy small. We had to order a second meal to feel less hungry. Not with the price at all.